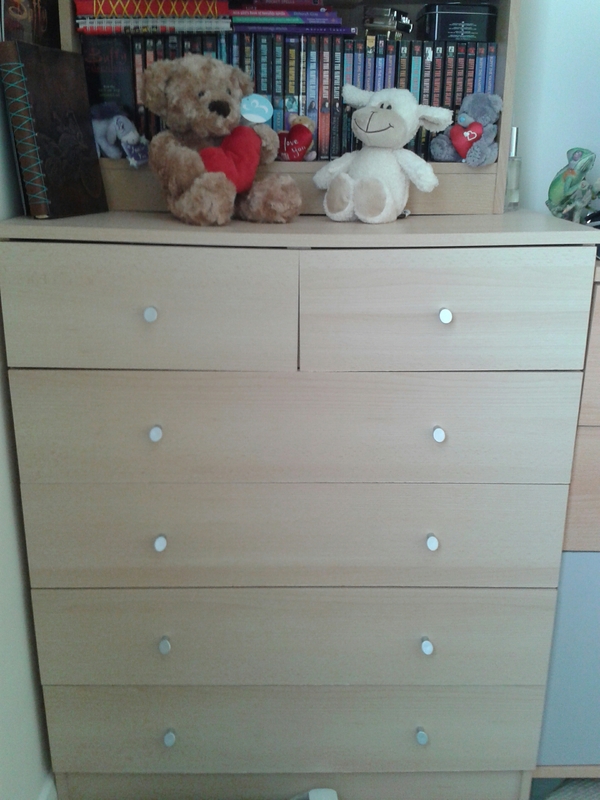 I’ve been meaning to sort through my wardrobe(s) and chest of drawers for some time now. 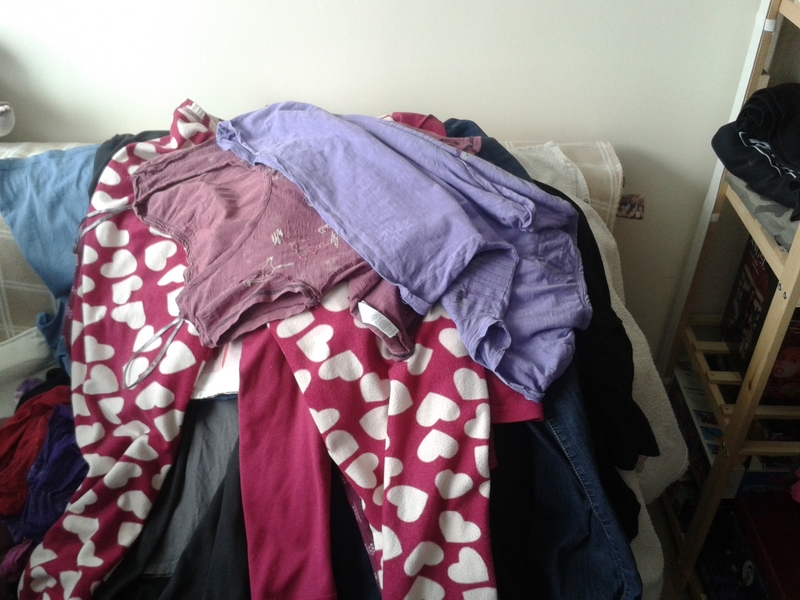 They’re full of clothing I no longer wear for a number of reasons and items (such as board games!) that should really have a home elsewhere. Today I decided enough procrastinating/excuses and to actually make a start! First I took everything out of my wardrobes and my chest of drawers and dumped on my bed which was the largest available space to work with. I sorted each item into categories: Tops (dresses), Bottoms, Jumpers and Jackets, Underwear, Shoes and Other – such as the board games I mentioned and various small items that had also made there way in there. I started sorting the non clothing items first. Keep, Donate/Sell or Bin. Which I found surprisingly easy to do and gave them new homes or returned them to where they ought to live. Next up – my clothes. I began by trying on all my clothes and asscessed each item. They were sorted into three piles: clothes I felt I didn’t need, clothes I wasn’t sure about and clothes I knew I wanted to keep. I went through each category of clothing at a time which makes it easier to determine if you have duplicate items of clothing or similar items. It also helps you from getting overwhelmed! Any clothes that were damaged beyond repair for example those with holes, tares or couldn’t be recycled into something else, like trousers to shorts went straight into a bin bag. Anything that didn’t fit or I hadn’t worn in ages (or at all) went into a donate/sell pile. Is the item damaged? Can it be fixed? Does the item fit me well? Are all aspects of it flattering (i.e. the cut, colour, fabric)? Do I love it? Would I re-buy it today? Will I actually wear it? Does it fit my lifestyle? Assessing my lifestyle and clothing needs. When deciding what clothing to keep and what gaps there were in my wardrobe, I asked myself ‘what kind of activities do I need to dress for?’. From this list, I know that the majority of my clothes should be made up of pieces I can wear to work and casual pieces. But at the moment my wardrobe is full of more casual pieces and more going out / special occasion wear than I probably need. With that in mind I made a list of items I needed either to fill a gap in my wardrobe or to replace damaged items. It’s important that each item suits my current lifestyle and the styles I like (based on my Pinterest clothing board). 2-3 vest tops – black, white or cream and colour. 2 netural coloured tops – black (already own) and grey or white (I prefer v-necks). 2 long sleeved tops for layering – I have a black one and would like a white or cream one for my under my lighter coloured clothes. As well as a coloured one (blue / purple). 2-4 coloured or patterned t-shirts or blouses – blue, purple, etc. Should be suitable for work and casual wear. 2-3 patterned dresses – I have two already that I love but would like one more in a pastel colour. Should be just above the knee. Little Black Dress – should be suitable for work and casual wear. 1 neutral coloured dress – should be suitable for work and casual wear. 2 pairs of jeans in a dark wash – I would like one pair of boot cut or straight leg, and one skinny fit. 1 pair of black skinny jeans – already own. 2-3 coloured jeans or chinos – I own a pastel purple pair of jeans and would like a maroon or plum colour and/or olive. 2-3 pairs of neutral coloured trousers for work – black, grey and a lighter colour (beige?) for Summer. 1 black skirt – pencil or a-line. 2-3 coloured or patterned skirts. 3 Jackets – leather jacket, raincoat, winter coat. Of course this list doesn’t include workout wear, shoes, socks and hosiery or underwear but it’s a good starting point for me. 🙂 If you’re looking to start or refresh your own wardrobe I’d recommend Putting Me Together’s Wardrobe From Scratch Series. 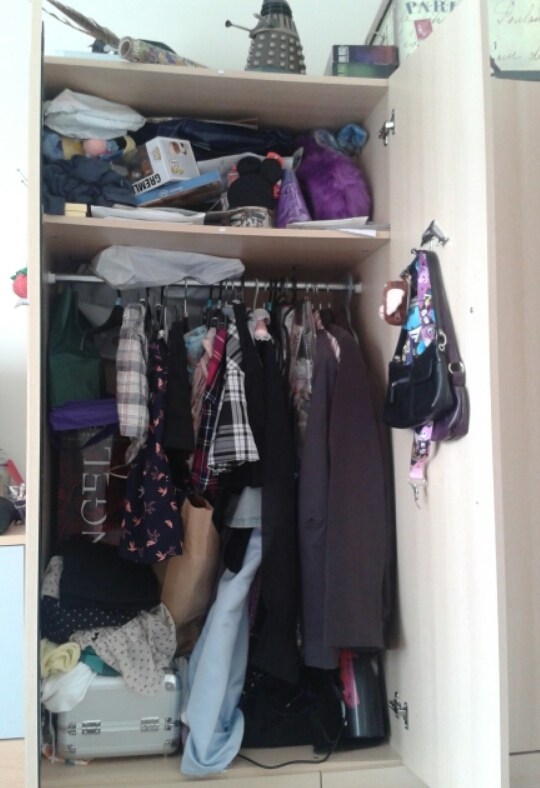 With my wardrobes decluttered and my shopping list for my next trip into town ready, I could put the clothes in my keep pile back in my wardrobe. 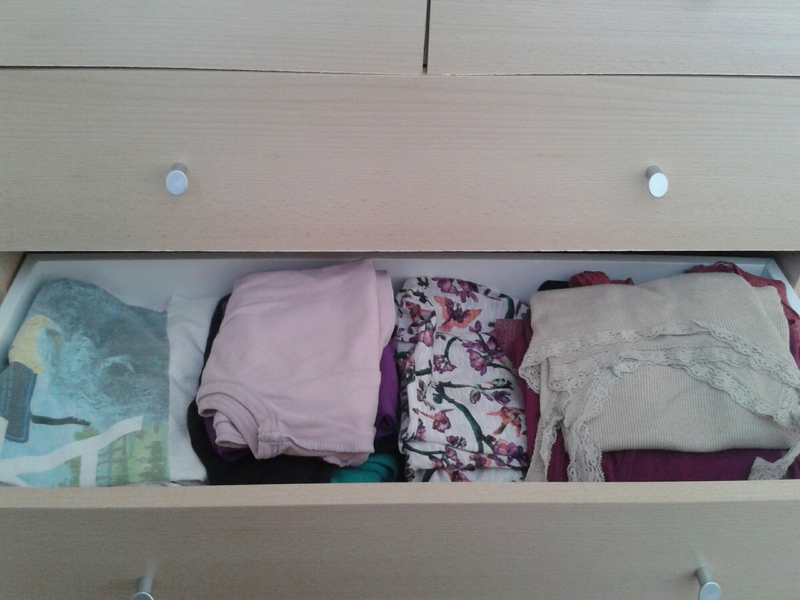 In my chest of drawers I designated a drawer for each clothing type and used drawer dividers to separate similar items for example short sleeve and long sleeve jumpers. Each drawer was lined with a lavender scented drawer liner from Lakeland and some handmade scented drawer sachets (lavender again). How do you store your clothes? Do you like to declutter? I think it can be very theraputic. Let me know in the comments.